Hi guys! How are you all on this glorious Saturday? 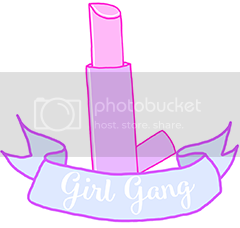 I know this blog is coming a little late, but my ma is getting internet in her house this week so I'll be able to blog earlier in the week, yay! Today I'm going to focus on something non beauty related, I'm going to put a little compilation here on some of my favourite photos of all time. I think photos are the most important things that we have that give us a glimpse into other people's worlds, the past, important events, good memories and everything in between. They say so much without using words and evoke so much emotion, again, without using words at all. For those of you that don't know, I am a huge history nerd, I always have been, I love it so so, so much, it's so interesting! Hence why alot of these photos are from the past. So, let's get started! Warning! Some of these photos are highly disturbing, so read at your own risk. Vulture stalking a child. This photo, without a doubt, is one of the most disturbing photos I have ever seen in my life. 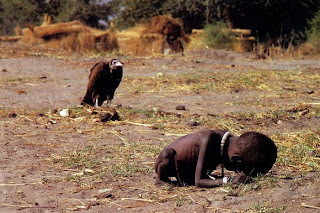 Taken in March 1993, Kevin Carter went on to win a Pulitzer Prize for his photo. The vulture is waiting on the child to die so it can feed itself. Haunting. The fate of the starving girl is unknown. Carter was criticised for not helping the child. He said he took the photo and chased the vulture away. Consumed with the guilt of not helping the child and what he witnessed, Carter committed suicide 3 months later. A wall of an Auschwitz gas chamber. My favoutite topic in history is World War 2 and The Holocaust, it's a fantastic example of how twisted and heartless people can be. The world will never forget the atrocities committed by mankind in this era. On the wall of the gas chamber, there are fingernail scratch marks etched into the concrete walls. This is highly disturbing and we today could never understand what it was like inside the gas chambers at this time. 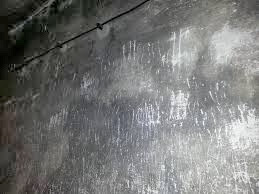 In other gas chambers in several other death camps, you can still see these marks and even prayers scratched into the walls in people's final minutes. Auschwitz is a place I have to see when I start travelling someday, I am undecided whether I will enter the gas chambers, I don't think you would ever be the same when you come out of one. Children running from a napalm attack. This photo was taken by Nick Ut, in 1972 during the Vietnam war. It shows terrified children running from a napalm attack when a south Vietnamese plane accidentally dropped napalm on their own villagers, a mix of gelling agent and petroleum which sticks to skin and causes severe burns when on fire. In the middle, nine year old Kim Phuc ripped off her burning clothing. This photo added to the anti war sentient in the US and communicated all over the world how brutal the Vietnam war was. After Ut took the photo, he took the children to a hospital in Saigon. Onto a lighter and happier photo. I adore this photo so much, I really do. The photo shows the child asking Santa Claus for his father to come home, unaware that his father is already home and ready to surprise him. 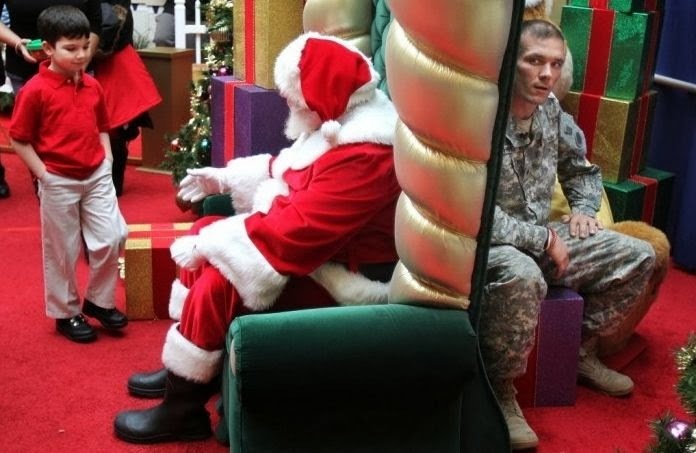 I love photos of children and soldiers seeing each other for the first time since they were deployed, it really pulls at the heartstrings. 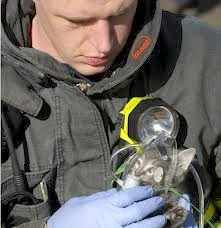 :) I would have loved to have seen a follow up photo to this. 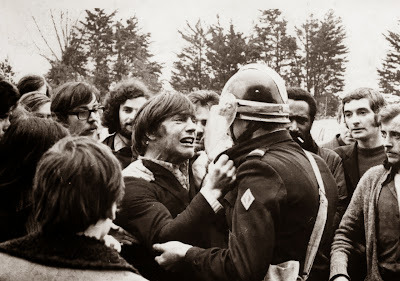 Two childhood friends meet during a demonstration, one is a striker, and the other, a policeman. From what I could gather of the backstory, this was taken in Saint-Brieux, France, in 1972 by Jacques Gourmelen. The protester in the photo recalls seeing his childhood friend and remembers feeling an intense rage “We were at a boil. ''When I recognized Jean-Yvon amid CRS, I blew a fuse. I grabbed him by the collar and I cried. I was telling him, go on, hit me. He would have never raised his baton on me.''. This is one of my favourite photos ever, it's amazing that two friends known as ''inseparable'' went on such different paths to the point that they would eventually have to clash with one another. The emotion on the striker's face really says it all. Graves of a Catholic Woman and her Protestant husband. Because of their different religion, the husband and wife were not allowed to be buried together. 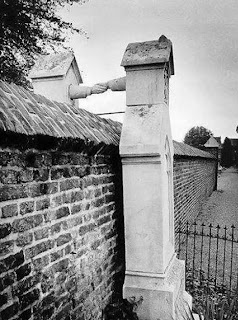 After 38 years of marriage, the husband died in 1880 and he was buried against the wall of the Protestant part of the graveyard. The wife died eight years later and decided that she did not want to be buried with her family, but on the opposite side of the wall, the closest she could get to her husband. The clasped hands connect the graves through the wall. I think this is such a beautiful idea, and that in death, they are still together. I think it's so sad that they could not be buried together just on religion. It was a grand idea on the woman's behalf to make sure she is buried as close to him as she could get, I love it. Vietnam street execution. 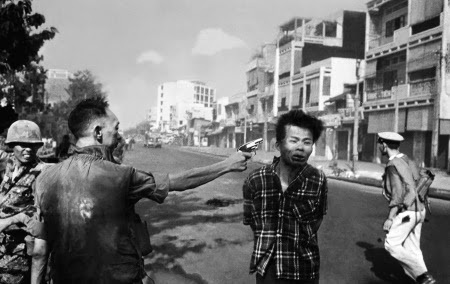 This photo depicts Tet Offensive general Nguyen Ngoc Loan executing a Viet Cong prisoner on the streets of Saigon. This was the most iconic and famous photos of the Vietnam war and lad to the growing disgust of the war in the US. What's not depicted in the photo however, is the context. The executioner, according to Eddie Adams, who took the photo, was a good and fair officer, and that the man he had executed, not only killed a south Vietnamese police officer, but his civilian family members. This shows that context is so important in a photo, and that the executioner was not a cold hearted killer that he was made to be, before the context was explained. Flower Power. 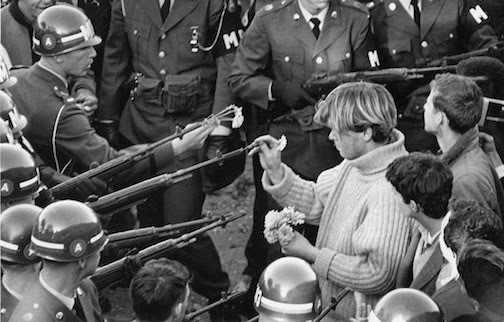 Taken on 21st of October, 1967 by Bernie Boston, this photo shows a young Vietnam protester sticking carnations into the rifle of a National Gaurdsman. In the Flower Power era, flowers were used symbolically against politicians and police, to fight civil violence with peace. I love this photo so much, it is like a stone thrown into water and it has a ripple effect, any protest after, flowers were handed to police and politicians. It gives us a glimpse into the past and shows that the protesters meant to come in peace, that they did not intend for violence to break out at the protest, as they were protesting for peace in Vietnam. It's representation of the anti-war moment in America. This photo truly says 1000 words. Well, I hope you all enjoyed that different post and I hope you loved the photos and they affected you like they affected me. Above all, I hope they made you think.